I have an intense interest in green technology, and fully intend to make that my chief occupation in the near future. The other day I was reading about Passivehaus design. 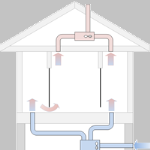 Passive houses are energy efficient, highly-insulated and very air tight houses that require almost no heating. That tightness, however, requires that they be properly ventilated so that the inhabitants can breathe and remain generally healthy. 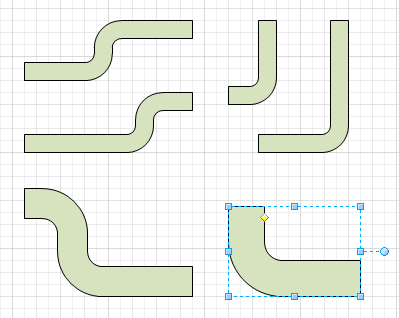 As I was imagining legions of Visio users toiling over the basic house frame and curved piping shapes, I whipped up some SmartShapes to make them easier to work with. The whole house frame is a single shape, with adjustable parameters. Quickly drag the width and height of the shape to rough out the general size. Overhang, beam and joist sizes can be altered using Control Handles and Shape Data fields. We’ll talk more about the shape in a future article. Similarly, the L- and S-shaped pipe shapes are configurable. See the yellow diamond? That allows you to quickly and visually change the thickness of the pipe. The S-shaped pipe has a second control handle (not shown) for positioning the bend. I hope you enjoy using the shapes and that this drawing saves you some drudgery and precious time! Cool drawing with Visio. 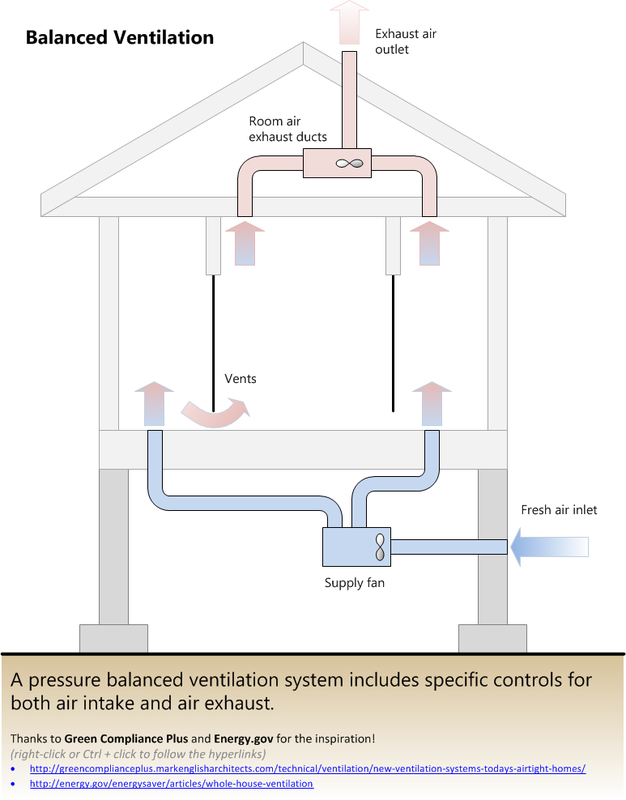 Now to make it really green, you need to show the whole house ventilator with the energy recover module (ERV – energy recovery ventilation) where the intake and exhausts are co-located and you can recover up to 80% of the energy you are currently exhausting in this diagram (cold or warm air gets heated or cooled from the basement system or by the other air in the space and then gets exhausted out of the bathroom exhausts or kitchen exhausts or the dedicated ventilation exhausts). Other than that, love you site! Nice, gives me some hope, just started working with VISIO (vs Autocad) and wasn’t its fan at first. Thank you!